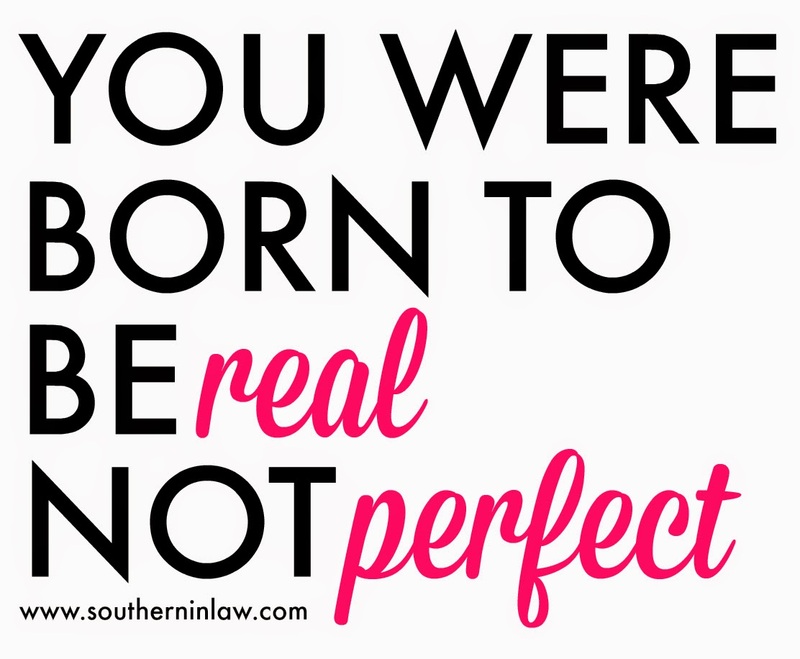 Southern In Law: I'm not a "Perfect Blogger" and That's Okay! I'm not a "Perfect Blogger" and That's Okay! I'm not perfect. In fact... I'm far from it. There are a lot of bloggers out there who would like you to think they're perfect, whatever that means. But I want you to know that I'm not perfect. I also want you to know that it's okay not to be perfect - because really, there's no such thing as perfect. How do you measure perfection? There are always those er words - better healthier stronger fitter prettier. It's easy to find yourself feeling envious - and easy to start comparing yourself. Whether you're comparing your blog or your life to someone else's. It's also really easy to get down on yourself. I don't want you to think I'm any better than you - because I'm not. Sometimes I get worrying emails from readers who think I'm some kind of superhuman - and every time I email them back, letting them know that actually, I'm just like them. It worries me because I don't want anyone to think that I'm someone that I'm not. I do not live a perfect life. But I wouldn't change any of that - because that's what makes me me. And there's no such thing as a perfect person. They don't exist! Anytime you find yourself comparing someone to you, I want you to remember that. As they say "The grass is always greener on the other side". Here's why I'm real, not "perfect". I don't post every single day because sometimes I don't want to - or I'd rather spend time with my family. I have baking fails all the time and sometimes I don't make anything new for days because I just don't feel like it. I work a full time job and I don't earn a living through blogging. I said no to blogging agencies who wanted to sign us (I'll tell you more about that another time) because it just didn't feel right. I don't say yes to every opportunity that comes our way because many of them just aren't right for us. Sometimes all we do on the weekend is sit at home and play video games or watch tv or bake. Sometimes I eat candy and ice cream and things with a whole heap of sugar just because I feel like it. I don't use Twitter or Facebook or Instagram for the blog as much as I'd like to because I just don't have the time. Sometimes I get sooky and whiney and complain about everything, knowing full well that I'm so incredibly blessed. I don't schedule posts in advance or plan my posts for the month (or week or day) because I'd rather sit down and write what I feel like. Sometimes I make recipes and don't photograph them or put them on the blog. I don't like eating Quest Bars and I don't drink smoothies every day and I'm never going to be on a paleo diet. Sometimes I don't make Jesse breakfast on the weekends just because I don't feel like it. I usually eat whilst typing away at the computer, looking at my phone or watching tv. Sometimes life just gets in the way and I don't want to sit in front of my computer. Instead of trying to be someone you're not - try being the best you you can be. I'm a real person. Yes, I write a blog and share my life with millions of people a year... but I'm just a normal person who's currently sitting here fresh faced, with hair that hasn't been brushed in ugg boots and "happy pants" from Bali. But tell me, what's one reason why you're not perfect? And what's one thing that you love about being YOU?! One thing I love about being me? I'm incredibly passionate and I give my all when I'm doing something I love. LOVE this - that quote is so so true! And exactly what most bloggers do - they only show their "perfect" sides.